Might as well be called Area 51, because we had no idea what was going on in here. The red highlighted area is Area A. Its huge. At first glance, it looks like a thick line of trees; but in reality this area only has a couple of trees and they are being smothered by monster weeds, vines and thorn bushes (that had grown to the size of small trees themselves). 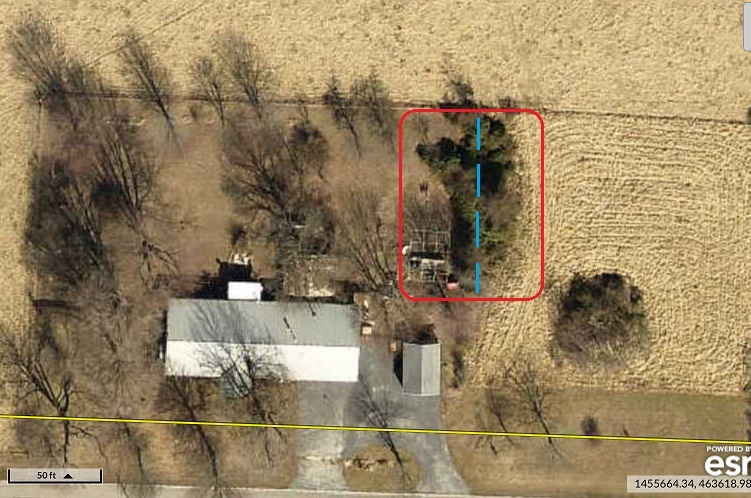 The blue dashes represent the approximate location of the fence. It was BURRIED by an honest-to-goodness wall of vines. 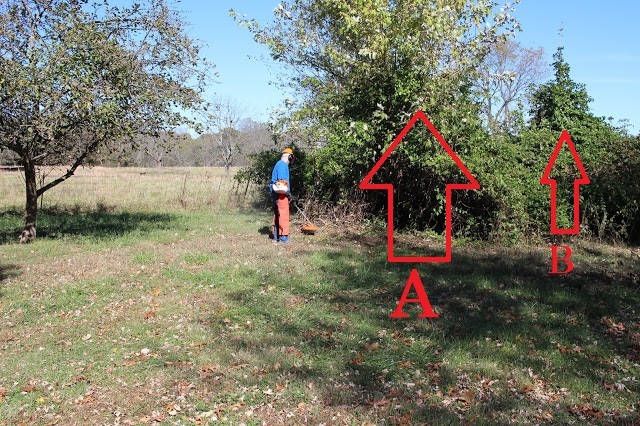 Arrow A is pointing to a Silver Maple that is completely overtaken by vines. We were thankfully able to save this guy. Arrow B is pointing to another tree that is also overtaken by vines. It's on the other side of the fence so we haven't gotten to it as of yet. We're hoping that we can save it as well. There's also a third tree behind Arrow A in the corner of the fence that we are working on saving. This area was so dense with vines, thorn bushes and weeds that we had to buy a heavy duty weed eater to help us tackle this. Aaron started work on this area while I was working on Area D next to the house. This weed eater is all business. Pieces of grass and wood were flying at a very high rate of speed as this machine did its thing. As you can see, Aaron is wearing canvas work chaps and a special helmet with headphones. The kids and I were safely on the other side of the yard while he meticulously started clearing this area. You can start to see the fence after clearing out the front half. We were only able to get the front half cleared to the fence that perticular weekend. As we cut into the brush, we had to take breaks to rake the debris into a pile and burn it. We kept an eye on the fire as we diligently kept working away on this area. Due to weather and other life obligations, it was a couple weekends before we were able to get back out to the farm and get some more work done. More fence line is visible and we were able to save the Silver Maple! As you can see, we were able to save the Silver Maple! Look how the trunk is twisted. It was doing everything in its power to try and get sunlight. This was as far as we were able to get in 2017. It was a long and cold winter, and it still hasn't loosened its grip on the Midwest, and we're half-way into April! But we were able to make it out again in late March and I'm happy to say that we were able to finish clearing out this area of the backyard. We still have the other side of the fence to tackle. That will be it's own post, hopefully sometime this summer! In this shot below, you can see the tree that was hiding out in the very corner of the fence. We cleared as many vines off of it as we could get to from inside the backyard. Hopefully, it will stay clear enough until we're able to reach it from the field on the other side of the fence. These vines grow crazy fast, so it's a race against time before the tree is covered again. Here's a close-up of the layers of weeds and vines that we had to work through. You can see how the growth closest to the fence is completely dead and new growth has reached further out. The new stuff literally chokes out anything it can reach. Those vines were wrapped so tightly around the tree limbs that you can see the gouges. If you look closely at the main limbs about halfway up, you can see the tracks from the vines. Look at the sunset sky! Isn't she pretty? The boys love to sit on her and watch us work, or call to the cows. And here's a shot of the area from the driveway looking over the fence. At this point we just need to finish raking up the leaves and put down some grass seed! As of now, I've caught you up on everything we've done in the backyard to date, so I'll be updating this area in real time going forward. Here's a picture of the other side of the fence for Area A. We'll call this this "Field Side" of Area A. The trees are just now starting to bud, but you can't tell from this far away. All the "green" stuff you see are the vines, weeds and thorn bushes. This area is going to look completely different when we get done with it!